As anyone who’s made an origami frog knows, they’re both astoundingly cute and astoundingly hard to control when you try to get them to “hop.” (Tip: tiny frogs hop better than the bigger ones.) Rana Software takes this unique art form and packages it as a racing game: there isn’t any revving needed, nor refueling, but there’s a track and a finish line and most importantly, trophies. Unfortunately, you don’t get to fold your own origami frog (learn how under the Help menu), but you can outfit your frog with 16 different skins under Options, as well as setting the difficulty (the more difficult the setting, the more gold stars you’ll earn). There are two types of races: single and tournament. 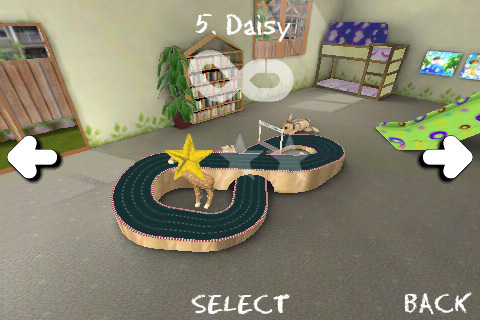 Winning races not only awards you with gold stars, but also unlocks new tracks for you to race on. Winning a single race will extend an invitation to participate in the accompanying tournament. 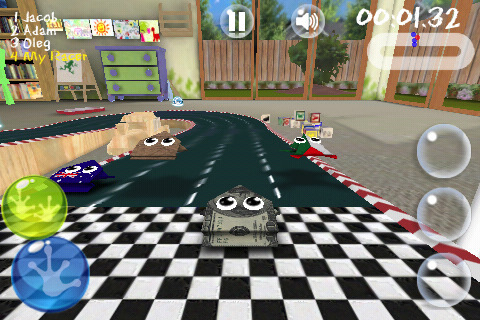 To play, hop your racing frog around the track to the finish line by using d-pad-esque controls. Tap and hold the blue bottom button to make short, abbreviated hops, and the top green button to make longer jumps; I’ve found that the long jumps require a longer “reload” time, meaning you must wait a moment before making another one. Along the way are 8 magic items you can collect, each with a special power to aid your frog in its race. To use the blue defense items, just tap it; red offense items need to have a target to be used, so an extra tap on an opponent is required. There are only a few slots for magic items, so double tap on any item you hold to discard it. I never imagined a childhood hobby involving folding paper would become a touch-sensitive racing game, so I can safely say that this is one unique game. And a finely made one, as well. The frogs are adorable, but the backgrounds are hardly an afterthought; in fact, everything is so finely detailed that Hop Race feels even more interactive. There’s a fun, upbeat soundtrack that fits perfectly. The great thing about Hop Race are the multiplayer options: you can compete with your friends locally or globally using wireless, Bluetooth, or online. Hop Race might not be the adrenaline-drenched racing game you’re used to, but it’s not without its charm and moments. Highly recommended for all ages (especially if you’re inspired build your own origami frog)! AppSafari review of Hop Race was written by Julie Guan on October 18th, 2010 and categorized under App Store, Fun, Games, Multiplayer, Physics Based, Racing. Page viewed 3772 times, 1 so far today. Need help on using these apps? Please read the Help Page.